The doctrine and political ambitions of Caodaism or “Great Way of the Third Cycle of Universal Salvation of the Higher Realm” (Cao Ðài Đại Đạo Tam Kỳ Phổ Độ) meant to address to Vietnamese people, who receive the mission to spread out all over the world humanistic messages produced during spirit-medium séances, for the acquisition of merit and less heavy punishments at the time of the Last Judgment (cuộc đại phán xét) and of the End of the World (tận thế). These “automatic writing” séances are intrinsically part of the creation and of the development of Caodaism. Run collectively or individually (through meditation), these rituals of communication with spirits (deities or ancestors) produce messages or oracles in Romanized Vietnamese and French. Caodai spirit medium practice draw its inspiration from a Chinese Daoist heritage (fuluan扶鸞, or fuji 扶乩, “to hold the phoenix” or “the ji,” i.e. a writing instrument), but also a Vietnamese one (đàn tiên or “Altar to Immortals”) and even a French one (Spiritism of Allan Kardec). Caodai temple duplicating the architecture of the Tây Ninf Holy See. (© 2015 / Jean-François Sabouret, Mekong Delta) The main altar inside the Holy See of Tây Ninh: the ubiquitous Eye of Master Cao Ðài – aka the Jade Emperor – painted on a Celestial Globe. The persisting idea that the Vietnamese civil servant Ngô Văn Chiêu (1878-1932) “invented” Caodaism, through a series of visions and messages from the Jade Emperor for instance, should not depreciate the collective enterprise which was at the root of this religion and of the invention of its theological tradition. In summary, Caodai leaders demonstrated their sociological capacity to build up both endogenous (businessmen or entrepreneurial, professors, Minh Daoist masters, political activists, etc.) as well as exogenous networks (spiritualists, free-masons, theosophists, French indigénophiles) in the colonised population. Especially, Caodaism offered Minh (ming 明, “Light”) spirit-writing and millenarian groups –that recent scholarship would designate as ‘redemptive societies’– a national level legacy by Vietnamising and translating their religious texts previously available only in Chinese into the romanised modern alphabet of the Vietnamese language (quốc ngữ). 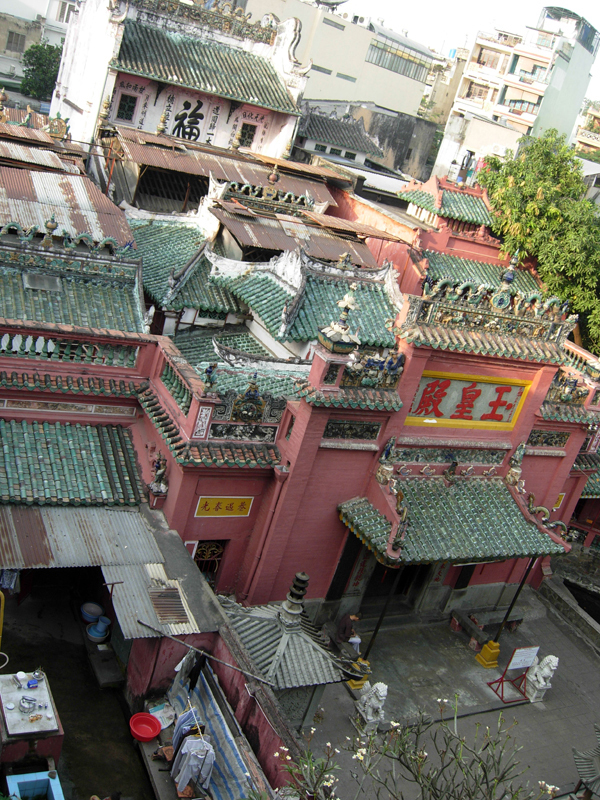 The actors involved in this reform process of the Three Teachings (Confucianism, Buddhism, Daoism) mostly sat at the crossroads of three cultural worlds—Vietnamese, French, and Chinese—which are a source of identity ambivalence with an impact within Caodai pantheon and architecture, as well as within its both Western spiritualist and Sino-Vietnamese spirit-medium practices. 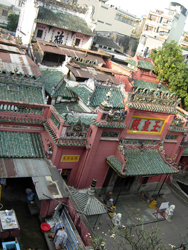 Temple of Jade Emperor, member of the Minh Sư redemptive societies network. The Caodai pantheon thus departs from the Chinese theological matrix, since it introduces a large number of Western spiritist names (Allan Kardec, Camille Flammarion, Victor Hugo) and Christian figures (Jesus, Joan of Arc), which status were revaluated (addressing Jesus as a saint for instance). The intentional syncretization in progress thus combined a modernisation of the Three Teachings tradition by a Vietnamisation of non-Asian symbols and characters. Caodai altar: Jesus below the Jade Emperor, Buddha, Laozi and Confucius, Nam Thành temple. Since French colonial period, Caodaism has created a strict hierarchical organisation in the hands of a group of mediums, thereby transforming the religion as either a potential rival or an ally of anti-Communist nationalist forces. This bureaucracy draws its inspiration from the Catholic Church, with its missionaries (giáo sĩ) and an ecclesiastical corpus of deacons, priests, bishops, archbishops and cardinals (and even a pope between 1927 and 1934), except for the initiative to confer hierarchical power to women (whom can be promoted up to cardinal status). Recruiting thousands of colonised peasants and civil servants during the first ten years, Caodaism offered a rare case of mass-conversion and became a crucial agent in the process of decolonisation in central and southern Vietnam, hazarding some missions to the North, but destined to fail due to Communist networking there. Indeed, Caodaism presented a genuine project of a religious society, drawing an ideological patron of a national or ‘state religion’ (quốc đạo)—whose borders corresponded to those of present-day Vietnam—that would have its Holy See in the province and the city of Tây Ninh, near the Cambodian border. This rubber land province was almost uninhabited and its choice revealed the Indochinese agenda of the Caodai mission (first mission to Phnom Penh in 1927). Carried away by enthusiasm, Caodai leaders sometimes had recourse to military alliance and political strategy to defend this project (armed by the Japanese or even the French in 1940-50s, with about 65,000 soldiers in 1954). Between 1964 and 1965, a Caodai follower, Phan Khắc Sửu (1893-1970), even served as President of the Republic of Vietnam. However, Caodai community has never been homogeneous, and it comprises more than ten denominations. Some of them cultivate political neutralism via asceticism and retreat from the world (Chiếu Minh denomination, “Unify and Lighten”). Others were committed to the Communist cause (Minh Chơn Ðạo denomination, “Way of the Pure Light”). Throughout this divided landscape, the “Centre for the Diffusion of the Doctrine of the Great Way » (Cơ Quan Phổ Thông Giáo Lý Đại Đạo) emerged in the years 1940–60 and claimed since then a synthesised and ecumenical spirit, that meant the accord of the branches, multiplying spirit messages and exegetic publications to support this discourse. However, every Caodai branches still polarise themselves around their proper mythological, symbolic, economical, political or institutional centre. This identity process redefines their relationship with the State and arouses competition between them in their road to legitimacy. Holy See of Ban Chỉnh Ðạo denomination. This complex and ambivalent past, in many ways, makes possible a better understanding of the two major phases undertaken by the new Socialist Republic of Vietnam in its relationships with Caodaism from 1976 until today. The first phase corresponds approximately to the years 1976 to 1986, and it is characterised by repressive measures imposed on the leaders who were opposed to Marxist-Leninist revolution and had collaborated with the Japanese, the French, or the Americans. More than a thousand of Caodaist were imprisoned, and thirty-nine of them were executed. The spirit-medium activity was specifically accused of being a political tool to create a State within a State. It was forbidden, likewise ceremonies, missionary and education activities. The three million followers as well as their temples and meditation centers were officially placed under the control of the Vietnam Fatherland Front (Mặt trận Tổ quốc Việt Nam). A Council of Management (Hội đồng chưởng quản) was installed at the head of each denomination, also controlled at the level of the province by the government (via a “Religious committee,” Ban tôn giáo). The second phase began at the end of the Sixth Congress of the Vietnamese Communist Party in 1986, when Vietnam wished to initiate a “renovation” (đổi mới) into its geostrategic and economic politics. State atheism progressively gave way to a controlled recognition of the social utilitarianism of religions and beliefs and of their full allegiance and loyalty to national identity. This turn showed signs of a certain softening with religious movements and even certain missionary dynamism (Caodaist, Evangelical, New Religious Movements) since the end of 1990s. The most striking example of this religious renewal was the transformation of the Tây Ninh Holy See into place of mass-tourism. In 1995, Caodaism even obtained a legal status as “religion” (tôn giáo) in exchange for transparency in all the activities of the official denominations. Furthermore, any Caodai organisation having shown at least twenty years of stability and good relationships with the authorities was able to ask for this official status as a main denomination of the Caodai religion. This was the case, among others, of the following denominations: Tiên Thiên (1995); Chiếu Minh Long Châu, Minh Chơn Ðạo, Truyền Giáo Cao Đài (1996); Tây Ninh and Ban Chỉnh Ðạo-Bến Tre (1997); Bạch Y (1998); Chơn Lý and Cầu Kho Tam Quan (2000); Minh Lý Đạo (2006). Henceforth, temples were reopened or built. Many Caodai exegesis got the approval for publication. If the ordinary activities of the worship (prayers, sermons, and ceremonies) still needed to be programmed and authorised administratively every year, they were less dependent on arbitrary local and provincial authorities, and more dependent on the governmental Religious committee. 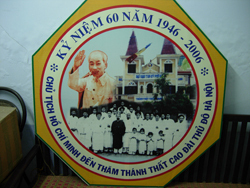 In the same spirit, in 1998 the authorities restored within each Caodai temple and denomination the welfare arm of Caodaism –the charity agencies (cơ quan phước thiện)– which had been banished after 1975. In both rural and urban areas, Caodaism is able to exert once again an influence through a series of philanthropic services (free clinic, geriatric centers, nurseries, preferential loan). These agencies aim to provide economical and physical protection to people in need (peasants, old, invalid or sick people, youth, etc. 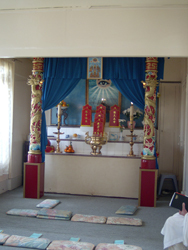 ), creating or strengthening patron-client ties with temples. A policy of appeasement between the government and Caodaism is noticeable since the promulgation of the “Ordinance on Belief and Religion” (Pháp lệnh Tín ngưỡng Tôn giáo) of 2004. This document encourages religious groups to develop charitable, medical, and educational activities and offers an official but fixed-term recognition to the most loyal religious actors of the nation. Hồ Chí Minh altar on a Caodai religious library, in Nam Thành temple, one of the founding temple of the religion. (© 2005 / Jérémy Jammes, Hochiminh City) Official poster celebrating the 50-year anniversary of the first Caodai temple in the North built by the Ban Chỉnh Ðạo denomination. Although it appeared to be demographically the main Caodai organisation of the country in 1975, the Tây Ninh denomination was relegated to the second rank in the 2009 National Census. It was ranked behind the denomination of Bến Tre (or Ban Chỉnh Ðạo, “Committee of Reform”) in the Mekong Delta. Both have approximately one million believers. The denomination of Bến Tre, established in 1934, is presented as politically more ‘neutral’ and included Communist partisans within its ranks. Finally, between 15,000 to 20,000 Caodaists scattered over sixteen countries, most of whom were boat people; a majority of them belonging to the Tây Ninh denomination, which is the most fervent anti-Communist denomination. 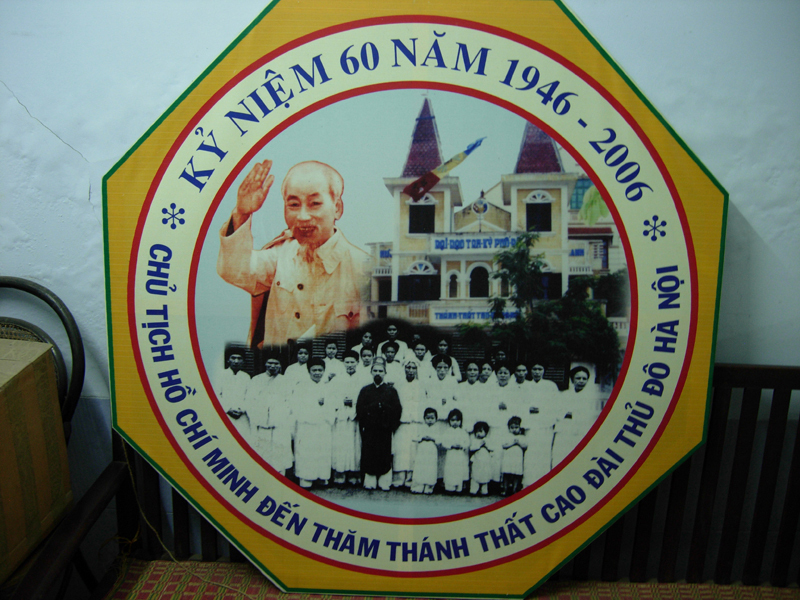 Between 1992 and 2006, an organization had federated their transnational activities, the Cao Dai Overseas Missionary Association (CDOM). The Vietnamese government had been displaying signs of greater tolerance since the reform process mid-1980s to facilitate the return and the investments of the boat people in Vietnam. Main altar in a temple in Paris suburb. In November 2006, negotiations between the CDOM, the current authorities of the Holy See and both the Vietnamese and Cambodian Ministries of Foreign Affairs allowed the repatriation to the Holy See of Tây Ninh and the worship of the mummified body of the late charismatic medium Phạm Công Tắc (1890–1959) since his death in exile at Phnom Penh. In exchange, the CDOM moderated its anti-Communist discourse, which entrained its dissolution since then. The integration process of this Caodai transnational community in contemporary Vietnam is polarized on two driven forces, i.e. the utopia of a national and missionary religion, as well as the free practice of Caodai spirit-mediumship – still banned. This ideological agenda still generates a reactive and clandestine production of spirit messages in overseas but also in Vietnam, guaranteeing the religious dynamism of today’s Caodaism. These texts are more or less politically-driven and they overall reflect the multipolarity of the Caodai phenomenon, with its great diversity of branches and of relationships with Communism and central power. Book Series Co-Editor: "Asia in Transition"
Jammes, Jérémy. 2014. Les Oracles du Cao Đài : Étude d’un mouvement religieux vietnamien et de ses réseaux [The Oracles of Cao Đài: Study of a Vietnamese Religious Movement and of its Networks]. Paris: Les Indes savantes. Werner, Jayne S. 1981. Peasant Politics and Religious Sectarianism: Peasant and Priest in the Cao Dai in Viet Nam. New Haven: Yale University Southeast Asia Studies.